Racing Club Warwick manager Scott Easterlow says Saturday’s FA Cup win has left him hungry for more. 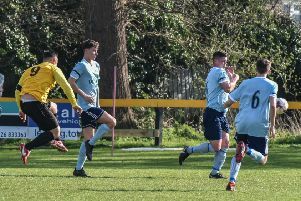 Racers overturned a 2-0 half-time deficit to beat Coleshill 4-3 and Easterlow says he wants to be playing teams the calibre of the Southern League Division One East side every week. “It was good for me to see our lads against higher opposition in a competitive match,” he said. “These are the leagues I want to see this club back competing in. A crowd just short of 250 were at Townsend Meadow and Easterlow believes they witnessed the right result, even if that seemed a long way off at the break. “Scoring the goal just after half-time was massive and what a goal. “After that we never looked back really. “If you look over the whole game we created more clearcut chances.